I successfully went the whole month without spending money on clothes!!! I'm not sure if I'll be able to keep it up in December as Net-a-Porter's sale will be undergoing some more price reductions during the month. I'm going to attempt to limit myself to only buying something from that sale. Although... rag & bone has a special Star Wars collection coming out tomorrow that I might be tempted by if the price is right. Just because I didn't spend money doesn't mean I didn't buy anything. I was well behaved until Cyber Monday when I remembered I had a J.Crew gift card from last year. I decided to check out their sale to see if anything tickled my fancy. (The sale was 40% off plus an extra 10% off AND free shipping.) I ended up with just one piece and still have $60 left on my gift card for another month where I need a pick-me-up. The sweater I bought is a modified version of a sweater from the J.Crew Fall 2017 Ready to Wear collection. I do prefer the larger scale of the embroidery that was in the collection but this sweater is still really cute and the sun, moon and stars hold special meaning for me. Now let's just hope it fits once it arrives! 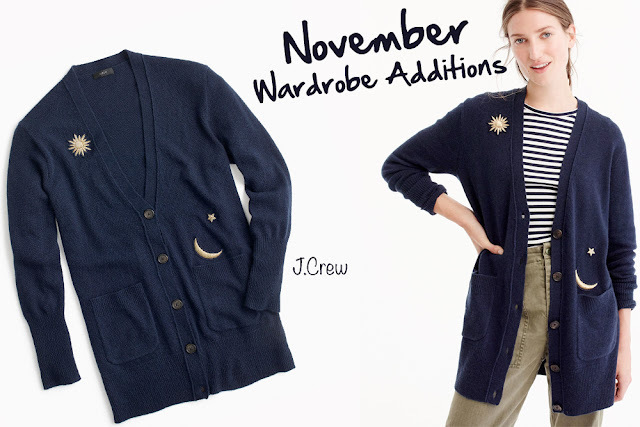 Oh that's such a cute navy cardigan! You did so well resisting the sales too. I was really good and on track to spend nothing on myself, then Cyber Monday hit and there was a bigger discount on Rebecca Minkoff....haha. I can't resist handbag sales! I'm just crossing my fingers and hoping it arrives before CHristmas, I haven't got notification of it shipping yet! Good job not shopping this month! I love the cardigan you got and I hope it works out!